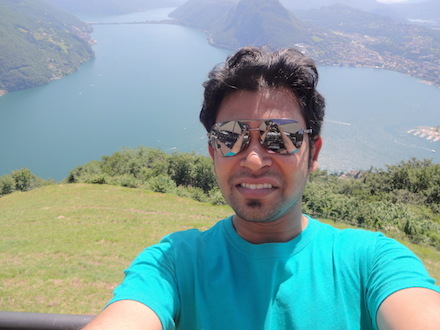 Piyush is back from the 8th International Workshop on Parallel Matrix Algorithms and Applications (PMAA 2014), where he spoke about his work on the concept of a self-stabilizing iterative solver, which could still compute a correct answer in the presence of temporary random numerical bit-flips. Click [here] for a copy of his slides. Rich is spending the week at ETH Zürich attending the Platform for Advanced Scientific Computing (PASC) Conference. 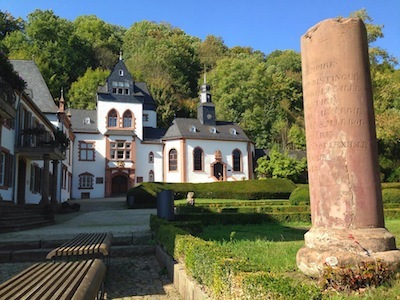 Many thanks to two of the co-organizers, Markus Püschel and Olaf Shank, for being great hosts! 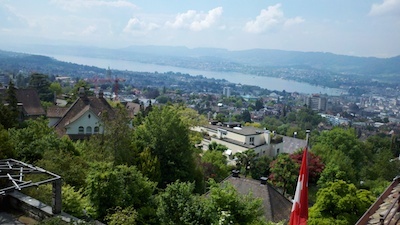 The view from Villa Hatt at ETH Zürich is not too shabby! Outside our group, Georgia Tech has a very strong representation this year. Looking at the program, we count 9 papers, including two of the four “Best Papers.” Go, Buzz! 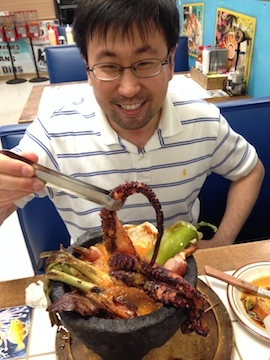 Jee chowing down on a pre-conference pulpo at Mariscos Sinaloa. Kent, in collaboration with Victor Lee among others at Intel, has an exciting new paper that will appear at ISCA’14. It teases apart the improvements in energy-efficiency due to process technology improvements and microarchitectural changes. Congrats to Kent, Victor, and the rest of the Intel team. We’ll post a preprint when it’s ready; stay tuned! Kenneth Czechowski, Victor W. Lee, Ed Grochowski, Ronny Ronen, Ronak Singhal, Pradeep Dubey, and Richard Vuduc. Improving the energy efficiency of big cores. In Proceedings of the 41st ACM/IEEE International Symposium on Computer Architecture (ISCA), Minneapolis, MN, USA, June 2014. (accepted). Jee is back from GPGPU-7, where he is presenting some new work on a hybrid CPU+GPU implementation of the kernel-independent fast multipole method, or FMM. 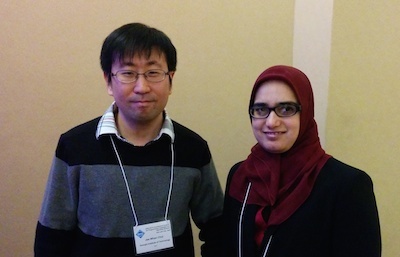 Piyush, Jee, and Rich are in Portland representing the lab at the SIAM Parallel Processing ’14 meeting. If you are also there, please drop by our various events! List below; resources (papers, slides) are here: [link]. Check us out at SC’13! We have a number of activities happening at SC’13 — if you are there at the Denver Convention Center this year, please check us out! Jee is competing in the Student Research Competition. He’ll present his poster, “Power and performance modeling for high-performance computing algorithms,” on Tuesday at the poster session, which runs from 5:15-7pm in the Mile High Pre-function Room, wherever that is. In addition, Georgia Tech has its usual large presence at SC13. See http://sc13.gatech.edu for details. 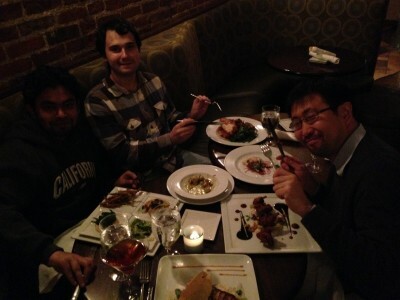 (L-to-R) Piyush, Marat, and Jee at our lab pre-conference celebratory dinner. Have a great meeting, gang! Rich just returned from the Workshop on Visualization and Analysis of Performance of Large-scale Software (VAPLS), co-located with IEEE Vis. The workshop featured a number of very compelling use of visualization to aid performance analysis, which in the long run will help make performance engineering more productive, accessible, and best of all, fun! 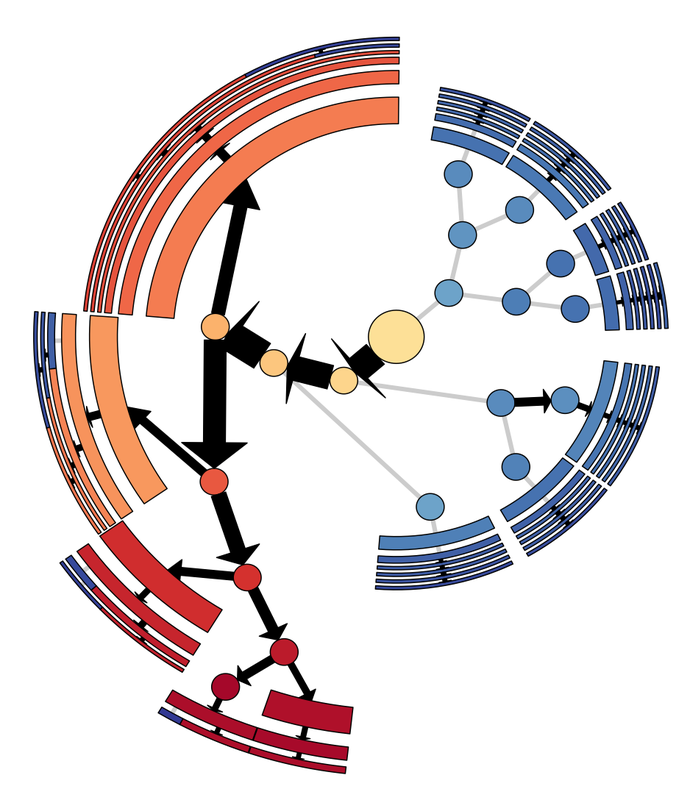 An example of abstractly visualizing communication volume on an AMR tree, taken from one of the other presenters (see VAPLS’13 website).